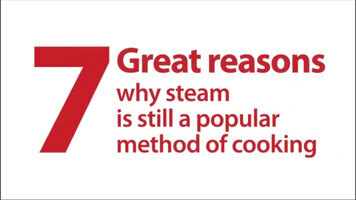 Why is steam still a popular method of cooking? It's the best way to preserve the nutritional value, color, and texture of food. It's also fast with no risk of overcooking or drying out food. It has an energy efficient means of transferring heat to food and it's not necessary to defrost food before steaming. It's easy to operate, clean, and maintain, flexible for large batches of recipes, quick for a la carte style cooking, and has no flavor transfer when cooking seafood and vegetables at the same time. So, why should you choose Cleveland steamers? They're the best in their class and have the industry's largest selection of models for every application. With Cleveland convection steamers, you have free venting and open drains to prevent pressure build up. Their units are easy to operate and are energy efficient. Cleveland steam jacketed kettles are 100% leak proof and have a high pressure steam jacket for speed and reliability. It also boasts a hose proof, splash proof design that prevents downtime and has a reinforced rolled rim that is dent and damage resistant. Plus, Cleveland's patented design cooks two to three times faster than competitors. Their tilt skillets and braising pans are both affordable and reliable. They have hi-low controls and high efficiency with forced air gas combustion. They are also all safe to use and easy to clean! Featuring 10 and 15 gallon counter top models, Cleveland has everything you need to professionally steam your foods. 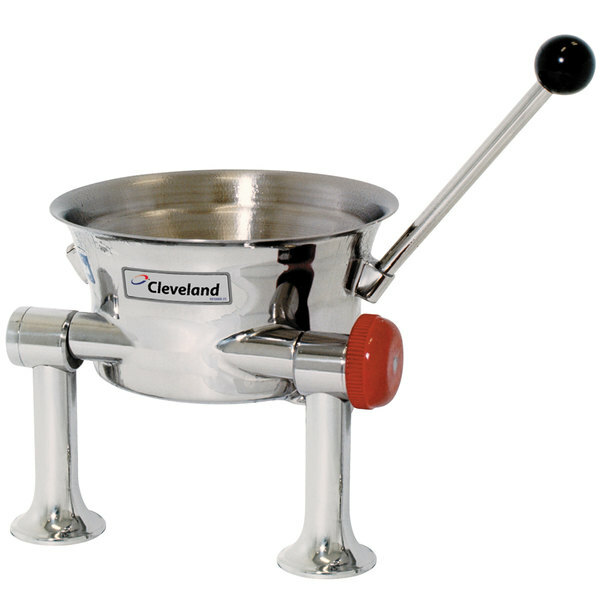 Boasting innovative designs for every application, Cleveland steamers are durable, affordable, and reliable. Cook foods fast and easily without flavor transfer with these units! The Cleveland KDT-1-T 80 oz. 2/3 direct steam tilting tabletop steam jacketed oyster kettle connects directly to your existing steam source to quickly cook up oyster stews, gumbos, steamed mussels, and steamed clams at your oyster bar! Its lever-controlled tilting mechanism smoothly pivots the kettle for easy pouring of products. This Cleveland 80 oz. tilting steam jacketed kettle heats evenly from all sides, eliminating hot spots to yield consistently ideal results. A 50 PSI rating, higher than many standard kettles, improves efficiency and performance. It features a stainless steel construction for easy cleaning, as well as a stylish mirror finished exterior, ideal for display on your oyster bar. The Cleveland KDT-1-T direct steam tilting 80 oz. tabletop steam jacketed oyster kettle requires a 1/2" NPT steam connection. Left to Right: 12 1/4"
Front to Back: 9 3/8"
Height (to kettle lip): 9 3/8"
Height (including handle): 12 1/2"